Nike x Liberty mark their tenth collection with an archive print that has been modernized for the first time. The Autumn/Winter 14 Collection features modern and heritage Nike footwear silhouettes using the Liberty print, Belmont Ivy. This striking, botanical artwork inspired by the entwining patterns of ivy clinging to architecture also reveals a subtle nod to the past as individual leaves show the markings of a British ‘One Pound’ note. 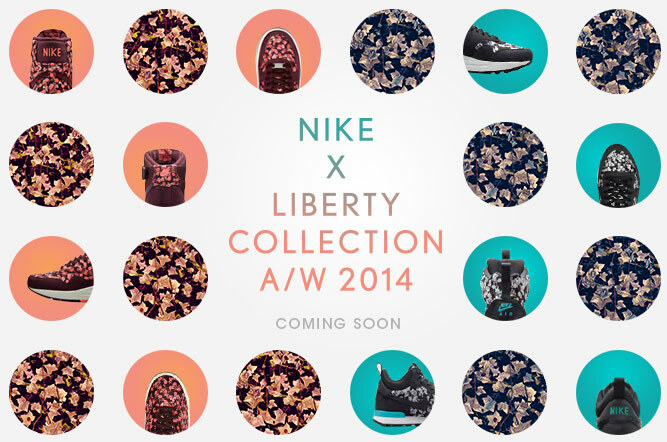 Want to be the first to know when Nike x Liberty arrives at OFFICE? Sign up and we will keep you up to date with the latest news. Gender Female Male Get the latest from OFFICE?